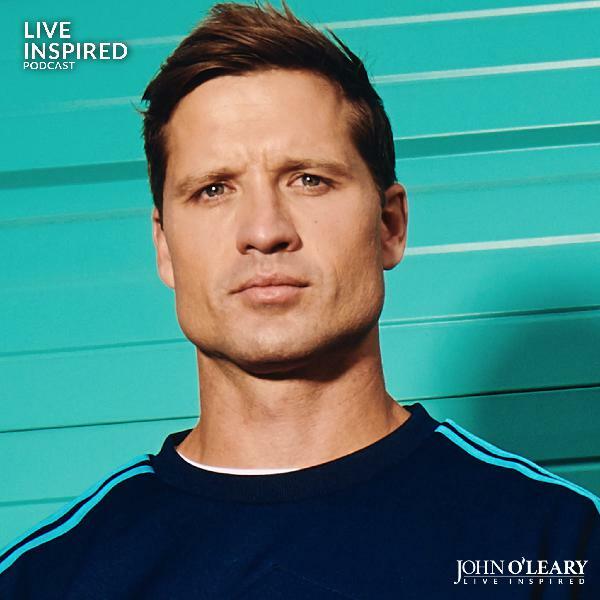 Live Inspired Podcast with John O'Leary | Listen Free on Castbox. 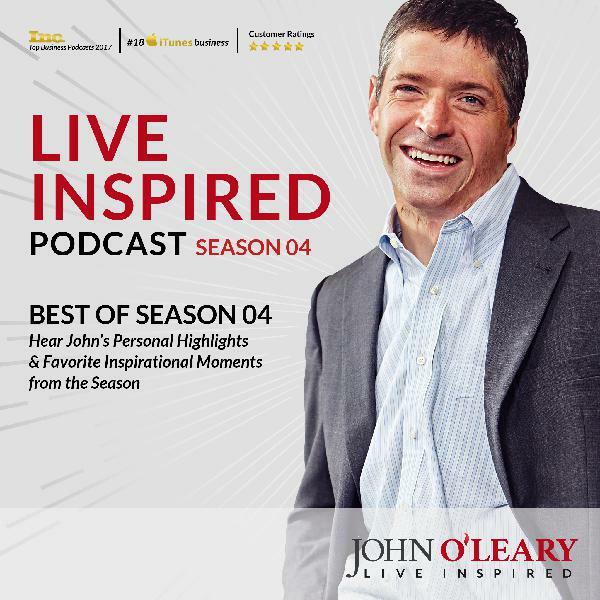 Live Inspired Podcast with John O'Leary is a top #20 on iTunes, biz! Each episode features an amazing guest who will share his/her story, successes, failures, lessons and life to help you uncover tips to apply in yours. Subscribe now so you can join John on a new episode every Thursday! Until then: Today is your day. Live Inspired. Join me every Monday for a quick burst of inspiration during Monday Moments. Each week, I’ll cover a different topic that will spark you to live more inspired. Today, I share a sneak peek from upcoming Live Inspired Podcast guest Fr. Tom Hoar and, his poignant question "have you had enough" + what asking it could mean in your life. Thank you to my dear friend, Live Inspired community member Mary B. for recommending Fr. Tom Hoar! If you have questions or feedback, you can always send them to me and my team at podcast@johnolearyinspires.com. *** Did you enjoy this episode? Subscribe, rate & review on Apple Podcasts or wherever you get your podcasts. Live Inspired with John daily on Facebook, Twitter, YouTube, LinkedIn, Pinterest, Instagram + get his Monday Motivation email. We live, play and work at an ever-increasing pace, amidst a lot of noise – yelling, fear, anxiety, texting, streaming, email. In this environment, we long for hope and humanity, but often give more reactive responses than ever. Today, we identify how we can influence our daily moments to make them more inspired. Rand Stagen, Managing Director of Stagen Leadership Academy, joins us to share how to create a little space between key stimuli – think of your triggers: a colleague’s sarcasm, your spouse leaving dishes in the sink, morning traffic – and our responses to them. Whether you're leading a large corporation, stuck in carpool traffic, or both: Today's conversation will give you tips and motivation to live a more inspired life – one intentional interaction at a time. SHOW NOTES: Stagen Leadership Academy strives to link the soft side of leadership with the pragmatic side. Leaders get the organizations and the families they deserve: Leadership is oriented around a sense of identity + taking responsibility. Power of transformation: organizations don't change, people do. If you want to transform a business, work on the leaders transforming themselves. How to start taking responsibility: Be grateful for the people in our lives who allow us to reflect on the gaps or holes in yourself, instead of being annoyed. Notice when you're triggered, or emotionally grabbed, and take unconditional responsibility. Recognize the gifts around us as opposed to pointing fingers. Between stimulus and response, there is a space. In that space is our power to choose our response. In our response lies our growth and our freedom. Be the author of your own life story. Most effective leaders have strong emotional awareness, both intrapersonal (self-awareness + self-management) and interpersonal (social awareness) Read Daniel Goleman's Harvard Business Review article What Makes a Leader here. Moods are contagious: The way you walk into a room will influence the room. Take note of the feedback loop of the experiences in your life. With awareness there is choice. Without awareness, there are only habits. 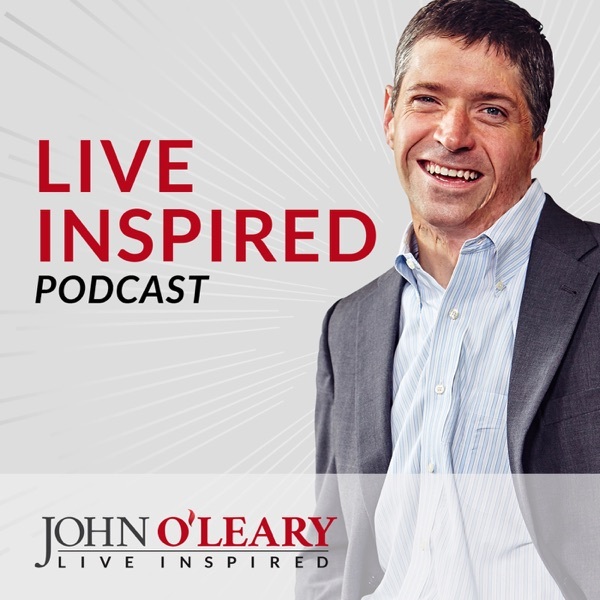 If you liked learning about how your mood can influence others, you'll love Live Inspired Podcast guest Jon Gordon, author of The Energy Bus, from ep. 13. Listen to Live Inspired Podcast ep. 49 with Dina Dwyer-Owens, co-chairwoman of The Dwyer Group, on someone who is leaning into conscious leadership. RAND STAGEN'S LIVE INSPIRED 7 1. What is the best book you’ve ever read? Scott Peck's The Road Less Traveled. 2. What is a characteristic or trait that you possessed as a child that you wish you still exhibited today? Curiosity. 3. Your house is on fire, all living things and people are out. You have the opportunity to run in and grab one item. What would it be? A photo album that has family photos that don't exist digitally. 4. You are sitting on a bench overlooking a gorgeous beach. You have the opportunity to have a long conversation with anyone living or dead. Who would it be? Pope Francis to try to understand how he is managing such a complex + important time in his institution. I think his answer would be a combination of intellect and spirituality because he's operating in the context of a multigenerational time horizon. I'm in awe of how he's showing up and the courage he's exhibiting. 5. What is the best advice you’ve ever received? Scott Peck said life is difficult and it's a journey. The journey is about engaging with life + learning to relate to life. Life is a dance between being shaped and shaping life. 6. What advice would you give your 20-year-old self? All we have is right here, right now. Learn to be present, not worry about the future, and not be critical of the past. 7. It’s been said that all great people can have their lives summed up in one sentence. How do you want yours to read? He cared. *** Did you enjoy today's episode? Subscribe, rate + review on Apple Podcasts or wherever you get your podcasts! Live Inspired with John daily on Facebook, Twitter, YouTube, LinkedIn, Pinterest, Instagram + get his Monday Motivation email. I had so much fun talking with my new friend + country music star Walker Hayes, that we stayed on the phone for two hours! We only had 45 minutes scheduled for his interview. That, my friends, has never happened before. I couldn’t wait to share a little of the fun with you. So today, you get a preview! Get the entire conversation on upcoming Live Inspired Podcast ep. 146. *** Did you enjoy this episode? Subscribe, rate & review on Apple Podcasts or wherever you get your podcasts. Live Inspired with John daily on Facebook, Twitter, YouTube, LinkedIn, Pinterest, Instagram + get his Monday Motivation email. Almost 13 years ago, I read Judith Shulevitz's New York Times article Taking Back Sabbath and still today, it has a profound effect on me. As a society, we've put such an emphasis on work and being busy and this article reminds us of the importance of Sabbath, what “Sabbath” is and what it means in all of our lives – regardless of our faith background. Today, our conversation with Judith will challenge you to build a pause into your week, nourish your community and remember that you are so much more than what you do. SHOW NOTES Judaism is an "orthopractic religion" (right living, not right belief) and the culture puts ritual, community + study above faith which is referred to as "practice." Judith references Derek Thompson's Atlantic article about our society making a religion out of work or "work-ism". Read it here. Depression + a sense that something was missing brought Judith back to practicing Judaism through the Sabbath. Sabbath: a day of religious observance and abstinence from work. Simply a day when we don’t work – all of us – at the same time so we can spend intentional time and create community together to remind us we are more than what we do for a living. The Sabbath is a central Jewish practice that later, over centuries, Christians took it over, moving it to Sundays for many reasons including it was a chance to differentiate Christians from Jews and Christ rose on a Sunday. Read Judith Shulevitz's New York Times article Bring Back the Sabbath here. Puritans + pilgrims came to America in quest of a perfect Sabbath and enacted the Blue laws, which were strict laws meant to maintain a calm atmosphere by closing civic institutions, allowing others to celebrate Sabbath. For many reasons, the Sabbath practice has faded. Fragmented time era: we no longer share a common schedule with others, leading to loneliness. Push back by putting electronic devices away together and connect as a group. Be conscious of the way we let commerce and capitalism colonize our time and isolate ourselves from others. Stop to reflect + enjoy what you have. The easiest way to take back the Sabbath: Have a meal together. Create a community with a tradition of breaking bread with others. Judith is currently working on a book that will answer the question, "why is the most important work anyone can do (reproduce + raise the next generation of workers) not compensated?" Get Judith Shulevitz book The Sabbath World here. If you were inspired by Judith's take on Sabbath, you'll love Live Inspired Podcast guests Mark Scharenbroich + Radha Agrwal. On ep. 40, Mark shared the importance of acknowledging, honoring, + connecting with those around us and Radha shared concrete ideas on how to combat the loneliness epidemic + build your community on ep. 98. If you like this podcast, you will love Live Inspired IN STUDIO. It’s my membership community where like-minded friends join me via live webcast to live inspired together. Registration opens soon! Join the waitlist. 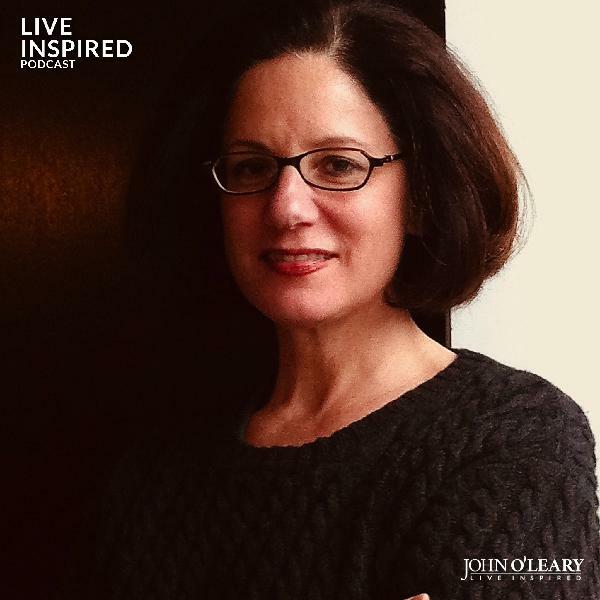 JUDITH SHULEVITZ LIVE INSPIRED 7 1. What is the best book you’ve ever read? The Bible. 2. What is a characteristic or trait that you possessed as a child that you wish you still exhibited today? Take in the wisdom of our elders. 3. Your house is on fire, all living things and people are out. You have the opportunity to run in and grab one item. What would it be? Books with photographs of my children. 4. You are sitting on a bench overlooking a gorgeous beach. You have the opportunity to have a long conversation with anyone living or dead. Who would it be? Founders of Karaitism [Nehemia Gordon and Ḥakham Meir Rekhavi] or Martin Luther. 5. What is the best advice you’ve ever received? Before you make a major change in your life, ask yourself, "what would it be like every morning to do that thing? Would it feel good or would it feel bad?" 6. What advice would you give your 20-year-old self? Trust yourself. Stop doubting everything you do. Stop wishing you'd done everything differently and realize that everything happened for a reason and move on. 7. It’s been said that all great people can have their lives summed up in one sentence. How do you want yours to read? I set a good example for my children. *** Did you enjoy today's episode? Subscribe, rate + review on Apple Podcasts or wherever you get your podcasts! Live Inspired with John daily on Facebook, Twitter, YouTube, LinkedIn, Pinterest, Instagram + get his Monday Motivation email. Join me every Monday for a quick burst of inspiration on our "Monday Moments" segments. Today, we celebrate National Sibling's Day this Wednesday, April 10 by reaching out to your sibling (or chosen sibling!) to share your love + gratitude for them. Listen to Live Inspired Podcast ep. #88 to hear the heroic acts of my siblings that saved my life 30 years ago and three ways to enhance your adult sibling relationships. *** Did you enjoy this episode? Subscribe, rate & review on Apple Podcasts or wherever you get your podcasts. Live Inspired with John daily on Facebook, Twitter, YouTube, LinkedIn, Pinterest, Instagram + get his Monday Motivation email. I've been so eager to bring Sparsh Shah onto the Live Inspired Podcast since I was first introduced to him in March 2017. Fifteen-year-old Sparsh shares about being born with Osteogenesis Imperfecta, or "Brittle Bone Disease", and how he hasn't let it define his life. Sparsh, also known by his rapper name Purythem, went viral with his rendition of Eminem's Not Afraid and since sang the National Anthem at Madison Square Garden. He radiates positivity while owning his disability with awe-inspiring grace. Today's conversation is beaming with contagious optimism + resilience that will leave you inspired. SHOW NOTES Sparsh was born with Osteogenesis Imperfecta, also known as Brittle Bone Disease. Sparsh has suffered almost 130 fractures, including his skull. "I've dissed my disability." There is always a valley before the hill. Sometimes the deeper the valley, the higher the hill. Ragarap: Sparsh began studying classical Indian + Western vocal music, blending aspects of each into his performances and creating his own sound he calls "ragarap". Rapper Eminem became an inspiration to Sparsh because of his dedication to improving his skills + overcoming a troubled background. Sparsh chose to sing Eminem's Not Afraid because of the uplighting lyrics that made him feel unstoppable; it ultimately became a viral hit viewed over 75 million times. Watch Sparsh Shah's TEDx Talk, where he speaks of turning the impossible to "I am possible", here. "When one door closes, another opens. We often look so long, hard and regretfully at the closed door, we forget that there was a door open for us." Why waste our life in the past when we can think about what to do now. "The past is history, the future is a mystery. The present is the greatest gift we can receive." - Bil Keane "Sometimes the storms interrupt our daily lives." Follow Sparsh on Facebook, Instagram and Twitter. If you enjoyed Sparsh's optimistic outlook of his disability, listen to Live Inspired Podcast ep. 7 with hearing-impaired comedian Kathy Buckley and Live Inspired Podcast ep. 63 with paralyzed barrel racer Amberly Snyder. SPARSH SHAH'S LIVE INSPIRED 7 1. What is the best book you’ve ever read? How to Win Friends & Influence People by Dale Carnegie. The Seven Habits of Highly Effective People by Stephen R. Covey. The Seven Habits of Highly Effective Teens by Sean Covey. 2. What is a characteristic or trait that you possessed as a child that you wish you still exhibited today? Resilience and optimism. My dad said I had a smile that would light up anyone's face. 3. Your house is on fire, all living things and people are out. You have the opportunity to run in and grab one item. What would it be? My MacBook. 4. You are sitting on a bench overlooking a gorgeous beach. You have the opportunity to have a long conversation with anyone living or dead. Who would it be? Jesus and I would ask him, "how and why is it that the life that is so imperfect, you made it perfect the way it is?" I've realized in life things are perfectly imperfect. 5. What is the best advice you’ve ever received? No matter what happens in your life, don't give up on your passion. No matter how many bones you break, your voice will never break. You can do anything in life, you've come here for a reason. 6. What advice would you give your 20-year-old self? (Sparsh it not 20-years-old yet!) 7. It’s been said that all great people can have their lives summed up in one sentence. How do you want yours to read? Though I struggled, I refused to suffer. And because I refused to suffer, I conquered. *** Did you enjoy today's episode? Subscribe, rate + review on Apple Podcasts or wherever you get your podcasts! Live Inspired with John daily on Facebook, Twitter, YouTube, LinkedIn, Pinterest, Instagram + get his Monday Motivation email. Join me every Monday for a quick burst of inspiration on our "Monday Moments" segments. Today, I take pause to celebrate Doctor's Day and share the important role play in all our lives. With a special shout out to my childhood physician, Dr. Tsifutis, who I recently got to have lunch with and thank in person. I reference the three lessons I learned from my burn doctors that I still live by today. Hear about these and how they apply in your life on one of our most listened to episodes: Live Inspired Podcast ep. #117. *** Did you enjoy this episode? Subscribe, rate & review on Apple Podcasts or wherever you get your podcasts. Live Inspired with John daily on Facebook, Twitter, YouTube, LinkedIn, Pinterest, Instagram + get his Monday Motivation email. The Kindness Diaries, streaming on Netflix, is a series that follows Leon Logothetis as he travels the world relying solely on the kindness of strangers, which he pays back in unexpected, inspiring ways. Leon joins us to share how a once “lonely kid” grew up to be a successful stock broker and then, upon discovering his passion for human connection and kindness, has embarked on the adventure of a lifetime. His new book, Go Be Kind, and this conversation will leave you ready to do exactly that. Join us to rekindle your belief in human kindness and its power to change the world… starting with your own. SHOW NOTES "We need at least one person to see us for who we truly are." For Leon, this was an after-school teacher Mrs. Mann. She changed his life profoundly. Watching The Motorcycle Diaries sparked Leon's courage to quit his job and follow his dream. First, Leon hitchhiked from Times Square to Hollywood Sign with just $5 a day, documented in The Amazing Adventures of a Nobody. During Season 1 of The Kindness Diaries, a homeless man taught Leon two lessons: True wealth is not in our wallets but in our hearts. Kindness is free. Kindness is a win-win. You win and the person you're being kind to wins. Your presence + kindness are the greatest gifts you can ever give. Until we are connected to our hearts, we are not living. Leon is filming Season 3 of The Kindness Diaries where he travels from Scotland to Singapore relying solely on the kindness of strangers. Leon Logothetis' latest book Go Be Kind is now available here. Watch Leon Logothetis' series The Kindness Diaries now streaming on Netflix. Learn more about Leon Logothetis on his website. I discovered Leon and his amazing story after I enjoyed his series streaming on Netflix. If you enjoyed hearing the story behind the series, check out Bill Courtney (ep. 28) from Undefeated, 2012 Oscar winner for Best Documentary and Jim Lovell (ep. 90) from Apollo 13. If you like this podcast, you will love Live Inspired IN STUDIO. It’s my membership community where like-minded friends join me via live webcast to live inspired together. Registration opens soon! Join the waitlist. 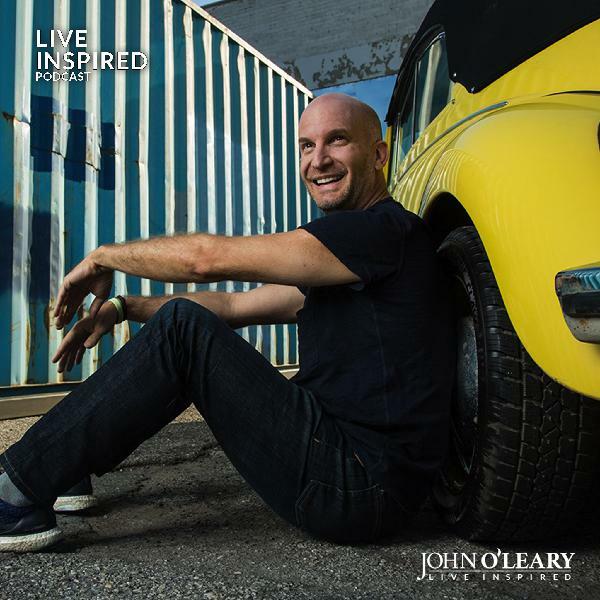 LEON LOGOTHETIS' LIVE INSPIRED 7 1. What is the best book you’ve ever read? The Drama of the Gifted Child by Alice Miller. 2. What is a characteristic or trait that you possessed as a child that you wish you still exhibited today? I am a child. Many of us lose our inner kid and I haven't. 3. Your house is on fire, all living things and people are out. You have the opportunity to run in and grab one item. What would it be? My passport. 4. You are sitting on a bench overlooking a gorgeous beach. You have the opportunity to have a long conversation with anyone living or dead. Who would it be? Nelson Mandela and I'd ask, "How did you spend 27 years in prison and be kind to the people who put you in there?" I think his answer would be, "Love is the only way". 5. What is the best advice you’ve ever received? "Never, never, never give up" from Winston Churchill. 6. What advice would you give your 20-year-old self? Keep going. It's all going to be okay. 7. It’s been said that all great people can have their lives summed up in one sentence. How do you want yours to read? He came, he saw, and he loved. *** Did you enjoy today's episode? Subscribe, rate + review on Apple Podcasts or wherever you get your podcasts! Live Inspired with John daily on Facebook, Twitter, YouTube, LinkedIn, Pinterest, Instagram + get his Monday Motivation email. Join me every Monday for a quick burst of inspiration on our “Monday Moments” segments. Today, my friends, we are stepping into spring! Nature is blossoming in front of us; offering a reminder that the best in life is yet to come. Today, let’s celebrate the three life lessons my beautiful magnolia tree offers. I promise, they will get you ready to launch into spring + beyond. Three lessons from magnolia trees: Life is seasonal. Loss is painful and leads to opportunities for growth. Life happens quickly. *** Did you enjoy this episode? Subscribe, rate & review on Apple Podcasts or wherever you get your podcasts. Live Inspired with John daily on Facebook, Twitter, YouTube, LinkedIn, Pinterest, Instagram + get his Monday Motivation email. Very profound inspirational episode. Personally, I too lost a dear adopted family member to suicide many years back. She was like a sister to us. I still feel her loss. It takes a lot of faith and spiritual wisdom to understand why these things happen. Society needs to deal with these issues in a compassionate manner. Thanks for sharing this episode. God bless! Great words! Hard to listen to, but a simple yet amazing science proven tool available for everyone. Thanks John and Mel!